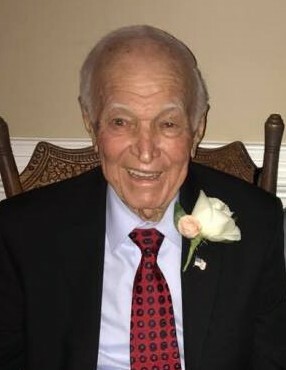 Mr. James Edward “Herb” Smith, 89, of Winnsboro passed away on Tuesday, February 5, 2019. Born in Marlboro County, he was the son of the late Willie and Clara Clark Smith. He retired from U.S. Rubber Co after 47 years and retired from the U.S. Army National Guard after 21 years of service as Master Sergeant with rank of E8. Herb played baseball for the Royal Cords in the Textile League, was an avid golfer, and enjoyed cookouts by the pool and vacations to the beach with his family. Herb is survived by his wife, Loretta M. Smith; two sons, Heyward Mattox (Dee) and Jeff Mattox (Karen); three daughters, Kimley Smith Wilson, Lisa Smith Bass, and Jenny Elliott (Mike); eleven grandchildren and seven great grandchildren. In addition to his parents, Herb is predeceased by his first wife, Claudette Smith; son, Todd E. Mattox; sister, Joyce Smith Davis; and brother, Harold “Red” Smith. Funeral services will be held at 3 o’clock PM Friday, February 8, 2019 at Gordon Memorial United Methodist Church conducted by Reverend Athon Arant. Burial with military honors will follow in Oaklawn Cemetery. The family will receive friends Thursday evening from 6-8 o’clock at Pope Funeral Home. In lieu of flowers, memorials may be made to Gordon Memorial United Methodist Church, PO Box 115, Winnsboro, SC 29180.